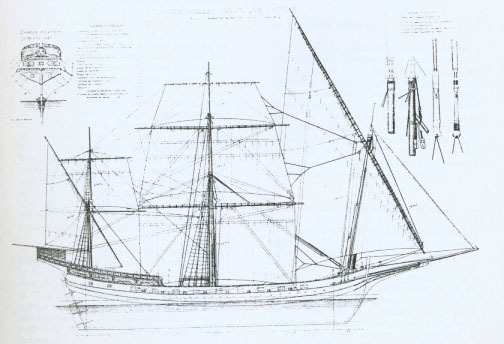 The story of the TS Pelican’s rig is fascinating on its own, but it reminds me of a question I’ve wondered about many times in relation to the great traditional song The Princess Royal, which tells of a pirate ship with strange sails that chases a ship bound for Newfoundland. I learned the song from a CD of the great Norfolk fisherman singer Sam Larner, who was recorded by Ewan MacColl and Peggy Seeger in the 1950s. In old Sam’s song, the Princess gets away by sailing upwind for a whole day until the pirate is lost. I’ve tended to think that the song is about a Barbary pirate because of a reference to ‘strange sails’, although there are plenty of alternative options, including home-grown British and Breton pirates. A feature of the song is that the pirates fired cannon shots during the chase, which didn’t make sense to me until I read the The Times article, for the image in my mind was of cannons firing broadside – but now I finally realise that Barbary pirates had their cannons in their bows and stern. But perhaps more interesting is the question of the direction of the chase relative to the wind, for the captain and first mate must have known that by sailing the bold Princess Royal upwind they would be putting their ship in the greatest possible danger – and if not they would very quickly find out. This last one should perhaps be dismissed, however, as we’re not told where it came from and there’s always the suspicion that it has been ‘improved’ somewhere along the line. And, of course, old songs aren’t famous for their unfailing historical accuracy: Chinese whispers and wishful thinking have a way of creeping in and changing the meaning in a way that appealed to some singer or audience along the chain of transmission. Whichever way they sailed to get away from the pirate, it’s still a great song, and here’s an MP3 file of me singing it for your entertainment – I can’t put up the Sam Larner version for obviousÂ copyright reasons, much though I’d like to share it! Ah, but could the Princess Royal song be a supterfuge by the pirates themselves? I always thought the Barbary Pirate used galleys, taking advantage of sailing boats when they were becalmed…hence had the cannons in the prow and stern to avoid their own galley slaves. Then to combat the priates and other Mediterranean unruly types, the Venterians put sails on their 50m galleys and combined wind and oar in the Galeass. Apparently six Galeasses sunk 70 galleys at the Battle of Lepanto. More pirate songs please – Instead of iTunes, why not Aye Aye Tunes? Now, I wonder why this obviously good basic rig idea used by the Barbary pirates and others fell out of favour? Next Next post: Can’t see what you’re looking for?